The Tread of Pioneers Museum staff and volunteers work closely with teachers to create curriculum-based school tours and other educational programs to best meet student and teacher needs. We offer tours, activities, and programs to fit all age groups and goals. Give us a call to discuss your needs and ideas, and help your students discover their heritage today. Call 879-2214 to discuss and schedule. Museums offer a dynamic opportunity to expose children to experiences and explore new things in a rich and educational environment. Through interactive exhibits and hands-on play, children have the ability to take ownership of their own learning and develop and explore their own curiosities. This unique exposure provides the foundation for creativity, critical thinking, and connection to the world around them. The staff of the Tread of Pioneers Museum would like to introduce you to our new museum tours and programs for your students. We can tailor our programs and tours to coordinate with state curriculum standards, with your ideas, or with what your students are learning in school, such as local and Colorado history, pioneer life, ski history, etc. Museum Tours (all grades): Your students can experience the 1901 Queen Anne-style Zimmerman House where turn-of-the-century period-furnished rooms take students back in time to imagine the daily life of our town�s first residents using hands-on elements such as an old-fashioned butter churn to make butter, wool carders, an antique wash board, and replica historic toys. Museum Exhibits: In our exhibits, students can explore the significant historical themes of our region. Our newest exhibit, Journeys West: Pioneer Tales from the Wagon Trail, features stories and information about how early settlers came to the Yampa Valley by covered wagon. Our Foundations of Steamboat exhibit highlights the history of the Squire/Hogue family, a long-time Routt County ranching family. You will love our touch-screen computer interactive exhibit with over two hours of multi-media audio/video segments that features the major topics of our area�s history - Utes, pioneers, agriculture, mining, town development, and more! NEW Pioneer Kids Bedroom Hands-on Discovery Exhibit: Step back in time to experience life as a pioneer child. Get hands-on: dress up in pioneer clothes, play with antique toys, and explore a realistic pioneer bedroom from the past. Each One Teach One Tour (3rd-5th grades): We�ve spent many months developing new interactive tours that will make your students� museum experience fun and educational. 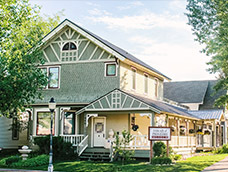 Each One Teach One Tour is a scavenger hunt in which pairs of students learn about Routt County history by searching the museum for information, then present this information to their classmates. With the guidance of our experienced tour guides, students learn about our local history and teach their fellow classmates. Colorado History Take Out (K-5th grades): Tread of Pioneers Museum staff received training from Denver�s History Colorado Center to implement two new Colorado history programs for elementary students. These two programs, �Western Work� and �Moving Day,� are extensive hands-on learning kits that include large floor maps, artifacts, historical photographs and fact sheets, and interactive learning activities. Western Work: Colorado Industries of the Past - Through objects, photographs and role-playing activities, students become �entrepreneurs� in some of Colorado�s most important industries. The program meets economic, history and geography state standards and explores natural, capital and human resources in state history. Moving Day: Colorado�s Migration Story - Students explore the movement of people across Colorado from prehistory to 1870 and these cultural groups: Puebloans, Mountain Men, Miners, Utes, Plains Indians and Hispanos. This program includes a large floor map that kids can move on. Pioneer Life Interactive Tour (2nd-5th grades): This is a fun, hands-on way for students to live the life of a real Routt County pioneer and includes activities such as ranching, homesteading, mining, and farming, with an authentic General Store where students can take their merchandise to sell or trade and buy products at 1910 prices. It�s a great way to teach history as well as economics, both past and present. Wagon Trail Game (2nd grade and up): On a large 3�x3� map of Colorado, this new interactive game traces the wagon trail route the Crawford family took from Denver to Steamboat Springs. Along the wagon trail, players are faced with series of actual trials and tribulations that require problem solving and decision-making. Players� choices determine if they will make it to Steamboat Springs successfully, or if their journey ends prematurely. Discovery Kits (K-5th grades): We have recently updated our Discovery Kits to meet state curriculum standards. These are hands-on learning trunks that teachers can check out for use in the classroom on the following subjects: mining, Utes, Native Americans, mountain man, homesteading, and archaeology. Full of artifacts, photos, videos, books, and complete lesson plans, you�ll love teaching history with these tools. See the attached brochure for more details. Storytime (K-2nd grade): A staff person dressed in pioneer clothing tells a story to your class about: traveling West in a wagon train; life as one of the first pioneers in Routt County; toys and games of pioneer children (with real replica toys to play with! ), and more! Go Behind-the-Scenes (3rd grade and up): Go behind the scenes with our museum Curator to learn about artifact preservation and see collections not on display. Other Activities: Ask us about our scavenger hunt for kids, the Lulie Crawford�s Diary program, and artifact study. New Ideas: What are your ideas? How can we best serve you and your students? Let us know, and we are more than happy to work with you! We can also combine any of the activities above. More programs are continually being developed, so just ask! We would like to remind you that the museum is FREE to all Routt County residents and students. Please call me at 879-2214 or email me at tmonahan@treadofpioneers.org to discuss how the museum can serve you and your students. To learn more about all of our activities and programs, check us out on the web at www.treadofpioneers.org. We look forward to seeing you and your students soon! For descriptions of each box, click here. Click here for details on all of our available school programs, tours and activities. Click here for School Tours and Programs. Click here for Colorado History Take Out Kits: Moving Day (Colorado�s Migration Story) and Western Work. Click here to download the Scavenger Hunt for kids.